So I think most of us have discussed in the past that we will not answer telephone calls from unknown numbers. How do you feel about visits to your house from unknown individuals? Just now there was a knock at my front door. As is my custom, I switched my TV over to the security cam channel to see who's there. Some guy in a baseball cap, jeans, and dark t-shirt. I don't recognize him, so I don't answer. After a moment the guy walks away then goes across the street and I can see him on cam talking to some other guy who he met up with on the other side of the street and then they walk away together. No idea what he wanted, but I'm curious. If you're sitting at home and you are not expecting anyone, and there's a knock at the door, or someone rings the doorbell, do you answer? My den looks out the front of the house and I can see people walking on the street, in the court, etc. Anyone walking around with clipboards, etc. going door-to-door, I don't answer. If someone is wearing an official uniform, like from the city, phone company, a police officer, whatever, I will answer. but if you're just some random shmoe? GTF off my porch. I answer and tell them no thanks immediately. It's usually faster. My wife won't let me talk to salesmen anymore. Which is fine. I just say, "no thank you, I'm not allowed to talk to strangers". 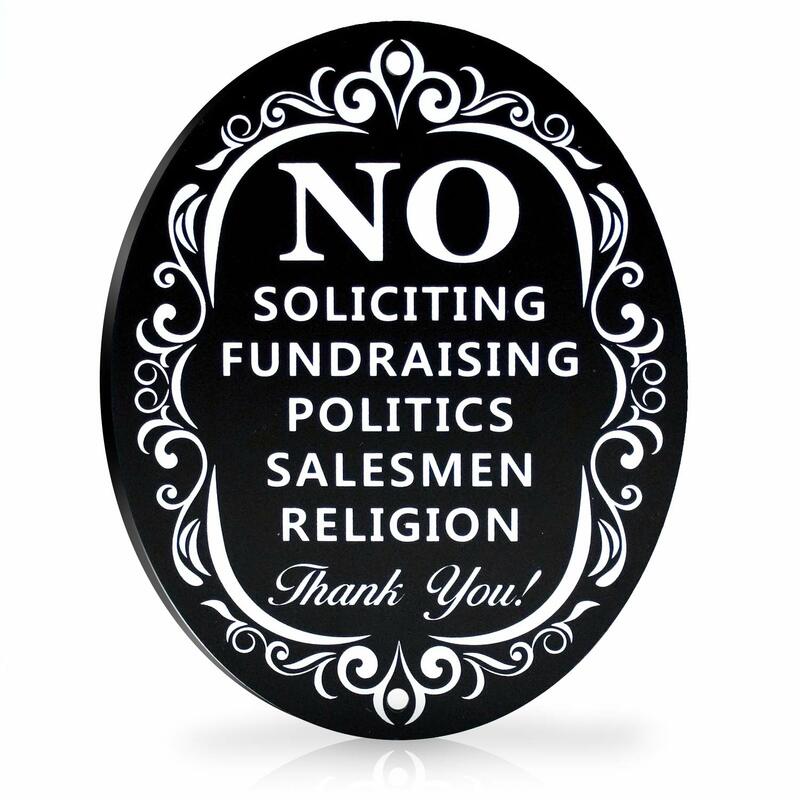 I hate the petition people more than the salespeople, actually, because there is less justification for giving them the cold shoulder. They're always so mortified that I won't sign whatever their cause du jour is, too. Usually I just say I don't sign petitions as a policy, but the last one was funny. She started her spiel about how Duke Energy was mismanaging funds for nuclear power and charging us too much money. I told her my wife works for Duke. The only exception is a local politician. If they're taking the time to walk around, I'll give them five minutes to listen to their pitch. Last time I answered it was Jehovah's witnesses. I talked to them briefly, after they left I wish I would've questioned them about blood transfusions more. See, for me, if you have a clipboard, or some documents you're trying to hand out, I might answer. If I can see a company vehicle with a logo on it and you're dressed like you're "at work", I might answer. This guy just now was just a civilian, as far as I could tell. Had nothing in his hands. He didn't go to any other neighbor's house and knock on any other doors, but as I mentioned, he met up with another guy who was walking down the street on the other side (this is a major, 4-lane road with a center turning lane, not a standard little residential neighborhood street.) They chatted for a minute then walked up another side street together. While he was standing on my porch he did take a pretty hard look at the Amazon package that was delivered earlier, and I half expected him to grab it, but he didn't. We get very, very few randoms back our 1200' driveway. A couple years ago a guy running for the local school board showed up right at dusk on Sunday evening. I had been shooting or hiking or something that afternoon and came out of the garage with a Glock 19 on my hip. He nearly peed himself, stammering out why he was there. I explained that my kids were homeschooled and he left very quickly. Our home office is the same (converted the dining room into our office); I can see anyone coming up the street and going door-to-door. If i see clipboards, I draw the curtains and wait for them to leave. My kids race to answer the door so we deal with it when folks come which isn't too often, on the flipside though they have no shame as kids so if you tell them to tell the person to go away they absolutely will and shut the door in their face. I answer. It kind of startles me when it is someone I don't know in the 6 ft frosted glass panels. I will admit, I have trust issues. 99% of the time, if a stranger engages me in some way, not just at my door but pretty much any time, I assume they're looking to take advantage of me. If I don't recognize you and you're knocking at my door, I assume you're a "salesman" who is actually trying to scam me, or casing the place for a future burglary. My dogs bark like the hounds of hell if you step on my porch, though, so I've got that going for me which is nice. My office too is front of house. Cams everywhere around the house, I know if friends or foes approach. Some days I troll them some I ignore. Since during the day I am here alone and car is in garage, I like to see how they act for a bit when I don't answer. Snoop about a bit and oh I'll greet you. page 3 reveal, I don't own a firearm. If I did, I might answer the door more often. Get the to the gun show.